The AZ Chapter of CPCU created the Light the Way Award to honor and remember Clay Hopkins. Clay was very active in Education for both the chapter and for the entire CPCU Society. He contributed to writing the CPCU Property textbook and taught the Property classes here in Phoenix for many years. He made a lasting impression on all he came in contact with. This award is reserved for those who are deemed to have made a consistent and powerful contribution to our chapter and to the local industry, in essence, “Lighting the Way” for others to serve and follow. The award is not given out each year, so as not to diminish the honor of receiving it. 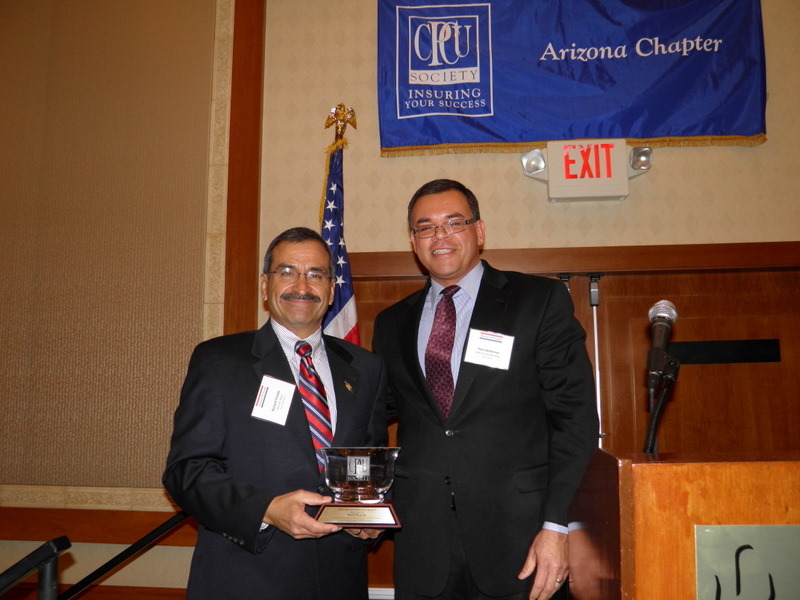 The Central Arizona Chapter of CPCU initiated the Yorrick DeSouza Service Award in 2003 to honor Chapter volunteers and recognize their “extraordinary service and selfless contribution” to the Chapter. The award was named in remembrance of one of its active members, Yorrick DeSouza, who passed away in 2002. After receiving his CPCU designation in 1999, Yorrick immediately began supporting the chapter’s activities by participating in Good Works services, being an I-Day Committee member and providing databases and spreadsheets for various Chapter activities. He could be counted on to support all Chapter events. At our December luncheon, Past President Brett Clausen presented the 2017 Light the Way Award to Rick Lambert, CPCU. In addition, Rick was also a member of the CPCU Society Membership Committee, Claims Interest Group Committee, Executive Committee and Professional Experience Resource Group Committee. His expertise and leadership was further put to work as he served as Interest Group Governor (2007 – 2012), as CPCU Loman Foundation - Term Trustee (2007 – 2012), and on the CPCU Loman Foundation Executive Committee (2009 – 2012). Will Thomas is Director in Product Management with USAA, leading a team of product managers responsible for meeting member needs and achieving financial and market objectives for a territory of 11 states. Prior to joining USAA, Will worked for ten years at Hanover Insurance Company and began his insurance career as a personal lines underwriter with Safeco Insurance Company. On November 14, Chapter President Brent Dohogne presented the Yorrick DeSouza Service Award to Will Thomas for his years of service to the Arizona Chapter and CPCU Society. Will has served in numerous capacities, including I-Day Committee Member, Chapter Secretary, Chapter Treasurer, Chapter President, Chapter Governor, and Leadership Council Member. Throughout his tenure, he has been known for his upbeat personality and inclusive approach to leadership, and everyone can agree that Will has brought fun with him into the Arizona Chapter. No one is more deserving of the DeSouza Service Award than Will Thomas. During our I-Day event on November 17th, Kim Ferrera, Chapter President and Will Thomas, Area Governor, presented the 2016 Light the Way Award to Brett Clausen. Brett is the Arizona Business Unit Vice President for Farm Bureau Financial Services. He’s our past president of the AZ CPCU Chapter, currently serves as the Vice President of the Professional Experience Resource Group of the CPCU Society and on the board of the Arizona Insurance Institute. Brett has a Master’s degree from Boston University and holds the CPCU, AIC, API, Are, AU, CIC designations as well certified Lean Six Sigma Black Belt. Brett was selected for this prestigious award for his ongoing contributions to the Arizona chapter, our local industry (including the Arizona Insurance Institute), and the Society’s PERG Interest Group, among many others. The implementation of the mentoring program is the just the latest example of how he continues to light the way for others to serve and follow. The Yorrick DeSouza Service Award is presented to Tom Gutierrez, CPCU. Tom is a Phoenix native and graduated from ASU in 1987 with a BS in management. He started in the industry in 1988 with Prudential as a personal lines underwriter, and earned his CPCU designation in 1994. After earning the CPCU designation, he has attained the CLU, AIC, ARE and ARM designations and is 2 courses away from earning the CHFC designation. He graduated from Boston University in 2006 with a MS in insurance management. In addition to Prudential, he has worked for Liberty Mutual, Farm Bureau Financial Services and is currently a product manager for MetLife. 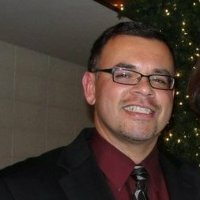 He joined the Arizona CPCU Society Chapter board in 2008, the executive board in 2009, and served as President in 2011-2012. Since that time, he’s continued to be involved, serving on the golf committee, I Day committee, scholarship committee and board nomination committee. He represented the chapter in the Insurance Workplace Taskforce, including the development of the curriculum for the new insurance certificate program being offered by Rio Salado, Mesa and Glendale Community Colleges. Tom also is a past president of the Arizona Insurance Council. 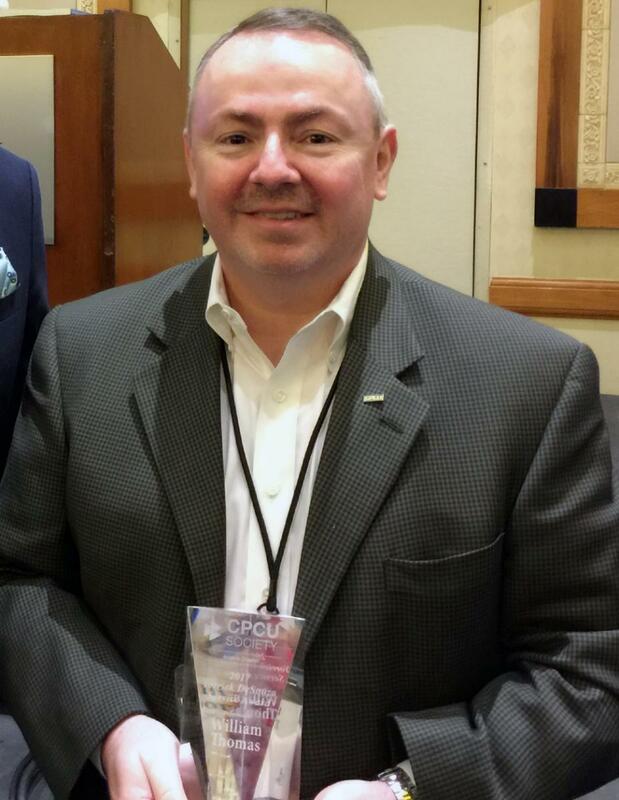 The 2015 Light the Way Award was presented to Rick Jones, CPCU. He received his CPCU designation in 1990 and is the Chief Operating Officer of CopperPoint Mutual Insurance Company. He has over 30 years' experience within the insurance industry, beginning with risk management for a division of Teledyne. He served as senior vice president of compliance and assistant secretary for CNA National Warranty Corp., opened the Arizona branch office of EBI Insurance Companies, and served as vice president of marketing at Corroon & Black (now Willis of Arizona). He is a licensed insurance agent in 47 states and in Canada, is past president of the Arizona CPCU Society Chapter and serves as a committee member on the Regulation and Legislative Interest Group Committee, since 1992 for the CPCU Society. He holds a Master's in Business Administration from Arizona State University's Executive MBA Program and completed an Executive Leadership Development Program at Darden School of Business. 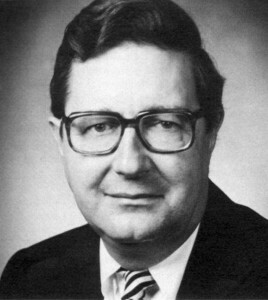 Jones is the past president of the Arizona Insurance Council and was instrumental in assisting with forming the Arizona Insurance Institute. He is currently Vice Chair of the East Valley Partnership and is co-chair of the Arizona Insurance Industry Charitable Foundation (IICF). Jones is also a member of the Dean's Council at the W.P. Carey School of Business, Arizona State University, serves on the board of the Sandra Day O'Connor Institute and on the board of Chicanos Por La Causa. 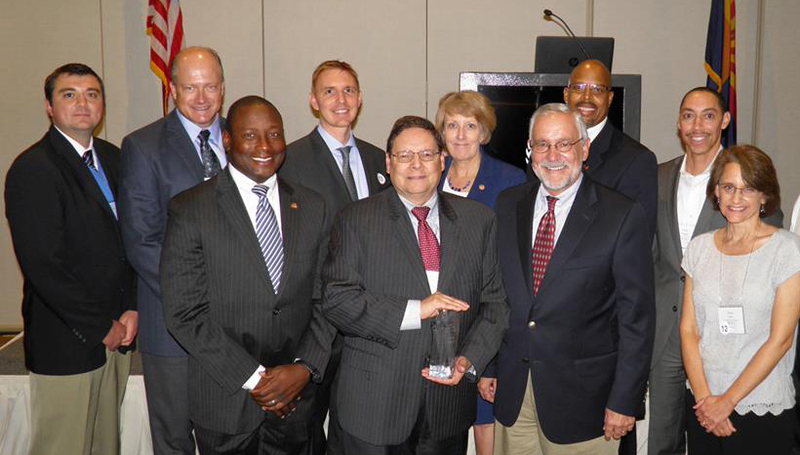 In 2013, the Arizona CPCU Society Chapter awarded Lamont D. Boyd, CPCU our Light the Way Award. This award is reserved for those who are deemed to have made a consistent and powerful contribution to our chapter and to the local industry, in essence, “Lighting the Way” for others to serve and follow. Since 1990, Lamont has contributed his time and service to the Golden Gate and Arizona CPCU Chapters in a variety of ways, most recently as Candidate Development chair. At the national level, Lamont developed the Society’s Student Program for Risk Management/Insurance and Actuarial students and he is past chair of the Information Technology Interest Group and incoming Chair of the Underwriting Interest Group. Lamont also serves on the board of the Arizona Insurance Institute, working to create a clearer path for Arizona students to join our industry. 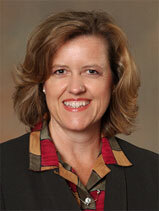 At the chapter meeting on May 16, 2012, Sandra Masters received the Light the Way Award. This award is reserved for those who are deemed to have made a consistent and powerful contribution to our chapter and to the local industry, in essence, “Lighting the Way” for others to serve and follow. Rich Pineda, is the most recent recipient of our Chapter’s highest award, the Yorrick De Souza Service Award. Rich was presented with the award at the January 18thmeeting. 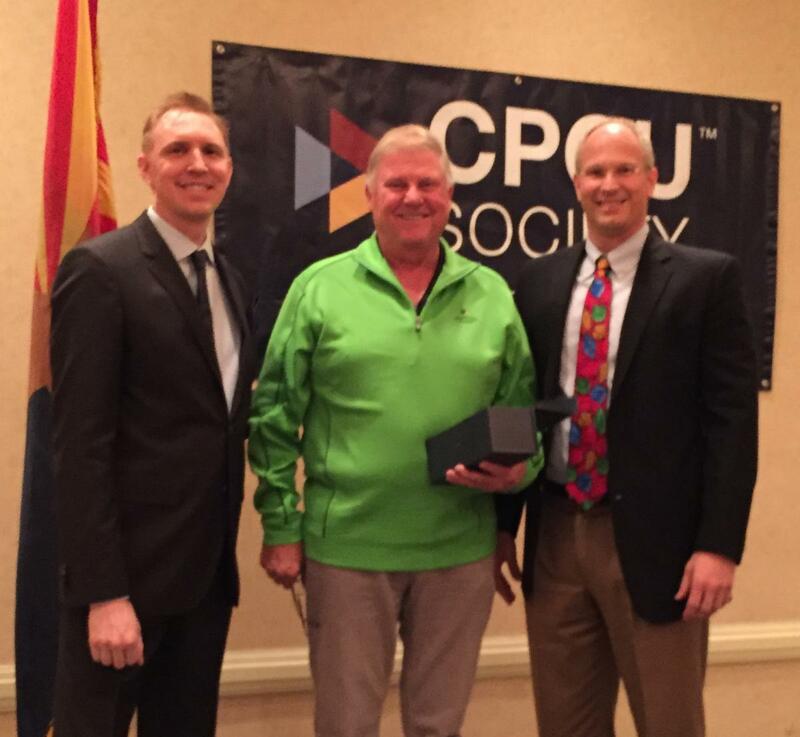 Rich has demonstrated tireless dedication to the cause of the CPCU Society, holding leadership positions in 3 different chapters, including President of the Arizona Chapter. He is very deserving of the award, which recognizes extraordinary service and selfless contribution to the work of the Chapter. Please join the Chapter in congratulating Rich on this great accomplishment!